When it comes to video editing software a common complaint I see on the video editing forums is that the software won’t do what it says it will do! Almost invariably the person making the complaint reveals by their question and subsequent conversation a basic lack of understanding about what they are doing and how the video editing software really works. Of course in an ideal world you should be able to just point and click your way to cinematic success…just like the product marketing says… right? In the past complaints were generally confined to problems that were being generated by computers struggling to handle the large amounts of data and the huge file sizes generated by the existing video file formats. Many of those problems were relatively easily solved by advice that even today stands true. Turn off background programs, defrag your hard drive etc., all the things that would release computer resources back to the video editing program. However the introduction of MPEG2 video, then MPEG4, H.264, and a slew of other very highly compressed formats has resulted in a huge increase in complaints about video editing software not doing the job. When you add in the complexity of the high definition versions of these video file formats, HDV and AVCHD, the excrement really has hit the rotary oscillator! So, I am about to attempt the impossible in an effort to help you understand what is at the heart of this problem. This is really technical stuff and I am going to try to keep it real simple. For the technically superior amongst you, please forgive me if my simplification offends you! If you are a sucker for punishment there is even more to read here on video file formats explained. Hopefully I will refer to these often and spare you from sinking into unconsciousness. So here we go! The modern batch of highly compressed video file formats were exclusively designed for playback or distribution… not editing. If those video file formats had been designed with editing in mind then right now hundreds of video editing software programmers would not be collectively jumping through hoops trying to nail down the definitive method of editing them. These new video file formats are not a strict set of rules and regulations that result in a very narrow set of parameters. They are very broad in their description and implementation. If you want an example take a look here at What is DVD? and you will see that within the “DVD Standard” alone there is a huge variation in what can be called DVD. For the programmers that means trying to create a video editing program that edits MPEG2′s (for example) BUT the question is what flavor of MPEG2… which one? The same applies to MPEG4 and others and is further complicated when we move to high definition video file formats. The modern video file formats you will encounter could essentially be described as derivatives of either MPEG2 and MPEG4. It doesn’t matter whether they are high definition or not they have the same inherent problem for video editors although high definition makes the existing problem worse. 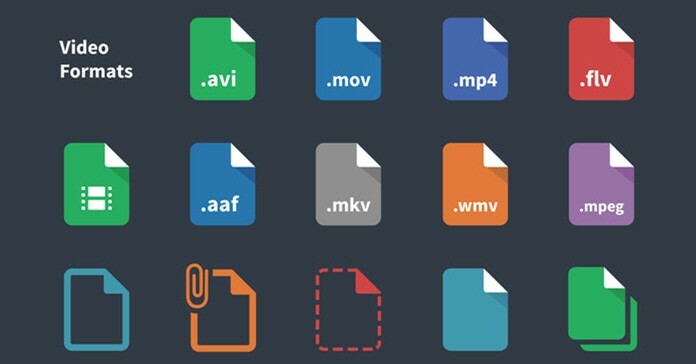 These video file formats are all basically made in a similar fashion and achieve their very high compression rates by throwing away information. The word “compression” is a bit more marketing than reality! They rely on a system of throwing away data that is unnecessarily repeated in frame after frame of your video. The data is replaced by a reference to an earlier or later frame rather than the data itself. So I am assuming you know that video consists of a series of pictures that are displayed one after the other at a set rate between 24 to 30 frames per second and from this you get the sense of motion… right? In these modern video files there are three types of picture and this is how the compression is achieved. These are easiest to think of as a complete picture. They are slightly compressed like a JPEG photo file is compressed but they are as close to a complete image as you will get. These are incomplete pictures and only contain the information that has changed since the last I-Picture or the last P-Picture. Imagine a bird flying though the air against a blue sky. The I-Picture is a record of the whole picture. The P-Picture is a picture of the bird in a changed position only. To display the rest of the picture on the screen (the blue sky which has not changed) the P-Picture tells the playback software to go get the data from the previous I-Picture or P-Picture. In the older video file types such as MPEG-2, P-Pictures can use only one previously decoded picture as a reference during playback. In MPEG4 or H.264 the P-Picture can use a number of previously decoded pictures as a reference during playback and this is one way greater compression is achieved retaining quality. These ones are the most highly compressed (had the most data discarded) because they can use information from previous I or P-Pictures and forward I or P-Pictures for reference in playback. This is the advantage MP4 variants have over MPEG2. In calculating motion and retaining smoothness MP4’s can scan forwards and back in the file for information. Wheras MPEG2’s can only go back for information. This also explains the huge demands that are placed on any computer trying to edit or playback these video files. The B-Pictures are demanding the software retrieve the majority of the information from Pictures that have already passed or that are yet to be played. So what the hell does that all mean! Actually I am not finished yet. These I, P, and B Pictures are arranged in a way so that the video file can be played back by software so are arranged into groups that will allow the best playback quality. These are called Groups Of Pictures… unbelievable they came up with that right? It would be too easy to call groups of pictures… Groups of Pictures right?… too self explanatory! So they are called GOPs. Why? Because geeky computer guys like that sort of thing and there is already a U.S. political party called the GOP so the possibility of confusion is ideal. There are generally two types of GOP, Short GOPs and Long GOPS, the short ones are… well… short and the long ones are… long! Now that you have at least an idea of how these video file formats achieve compression and smaller file size let’s take a look at them from an editing point of view. The first possible problem for the editing software occurs in the recording stage of the original file. In the short GOP example imagine there is the tiniest error or glitch that occurs in the first B-Picture of the sequence. Every Picture after that will snowball the effect of that glitch until we hit the next complete I-Picture because they use each other as reference points. Now imagine the same glitch occurring in the first B-Picture of the Long GOP sequence…yikes that’s 20 Pictures of compounding error until the next I-Picture! Video playback software will not usually be concerned by these errors because part of the playback software function is to detect and correct such errors on the fly so for playback… no problem! However, it is not the task of video editing software to perform that function, it is designed to edit the video file which is a far more complex procedure. If it is trying to make a cut, insert a transition or apply an effect to a part of the video file that has an error then it may… and usually does, choke! Similarly editing software is designed to render a new video file once you have finished your masterpiece. Very often you will get failures, glitches or computer freezes because the video editing software has hit some hidden data error within the original files… and just falls over when it hits that point. Worse still you can get a file that slowly goes more and more out of sync with the audio. Finally let’s imagine you are doing some editing and you want to make a cut at a specific point. Unseen to you is the fact that this particular cut will occur exactly in the middle of a group of B-Pictures. We know already that these are not full pictures, they are a little data and mostly reference to other pictures…right? So how is the video editing software going to do that? It is quite literally trying to make a cut where there is almost no picture! Take that example and apply it then to the Long GOP sequence that you would find in the new very highly compressed formats especially in high definition. You would be trying to make a cut in the middle of nowhere. To do that the video editing software has to use all the available information to create two I-Pictures either side of the cut point so that a new GOP can be started… the miracle is that not only can it be done, it can be done on a consumer level video editor! Cool! Another important issue in modern editing is to ensure that the original video is NOT re-encoded. MPEG2 compression and MPEG4 compression have their existing flaws and every time they are re-encoded the image quality slightly degrades. That is why is is vital to only use editing software that has a “smart encode” type feature that can identify those parts of your project that do not need to be re-encoded and to simply copy them to retain quality. I hope that at least sheds some light on to the current difficulties in MPEG2 editing and MPEG4 editing along with all the other new highly compressed video formats. My advice to keep you out of trouble? Right now the current video formats for editing have been around for quite a while and most of the mainstream video editing software can handle it quite well. Time is on its side. The trick to editing these files is in understanding that it is rarely the editing software that will be causing you problems. In almost all cases it will be a lack of computer resources that results in crashes, freezes, audio out of sync and a host of other difficulties which can arise. Whenever you are editing follow some simple basic practices. Shut down all unnecessary background services, close open programs you are not using, if possible disconnect from the internet, make sure your hard disc is defragged and never try to burn discs from the timeline regardless of what it says on the package!